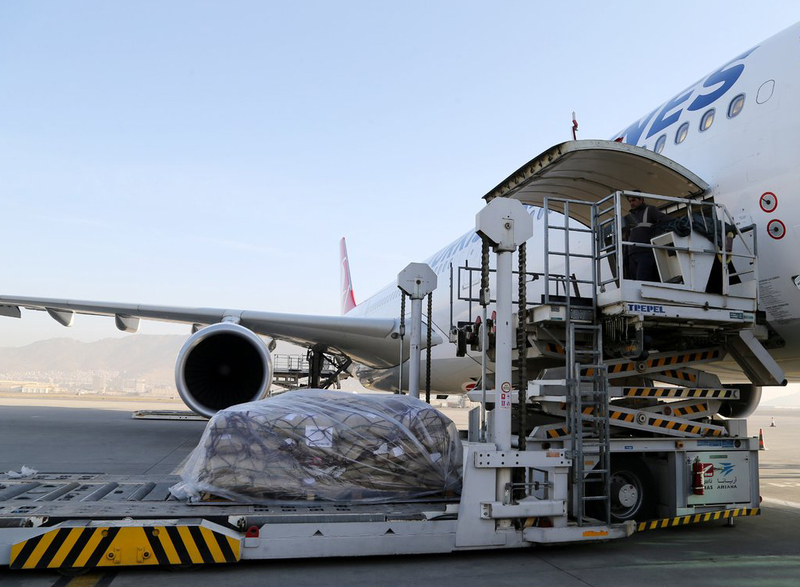 President Ashraf Ghani inaugurated Afghanistan-China air cargo corridor on Tuesday morning – an air corridor that will hopefully generate millions of dollars in revenue for Afghanistan a year. The Presidential Palace said in a statement that the new air corridor will be used to export between $700 and $800 million worth of Afghanistan’s pine nuts to China annually. During the inauguration Ghani said that pine nuts, pistachio nuts and cumin are hidden treasures of Afghanistan, and government is committed to bringing out its full potential via trade corridors. He also added that farmers are determined to protect pine nut trees and work to increase their productivity. The statement further said that 20 tons of pine nuts per day will be exported to China until the end of the season this year. Afghanistan’s total pine nuts output is 23,000 metric tons a year, and China is the major importer of the product. The president said local unions will be set up to pave the ground for loans in provinces. Pine nut trees are mostly found in Afghanistan’s eastern provinces of Nangarhar, Laghman, Nuristan, Kunar, Paktia, Khost and Paktika provinces. Pine nuts also constitute one of the major income sources for local people in these areas. A recent Pine Nuts Global Report stated one of the major drivers for this market is the multiple health benefits associated with pine nuts. * Pine nuts are one of the calorie-rich edible nuts. 100g of dry kernels provide 673 calories. Additionally, they comprise of numerous health promoting phytochemicals, vitamins, antioxidants, and minerals. * Pine or cedar nuts contain essential fatty acid (the omega-6 fat), pinolenic acid. Recent research has shown its potential use in weight loss by curbing appetite. Pinolenic acid triggers the release of hunger-suppressant enzymes cholecystokinin and Glucagon-like peptide-1 (GLP-1) in the gut. Also, pinolenic acid has thought to have LDL-lowering properties by enhancing hepatic LDL uptake. * Likewise in almonds, pine nuts too are an excellent source of vitamin-E. Vitamin-E is a powerful lipid soluble antioxidant, required for maintaining the integrity of cell membrane of mucosa and skin by protecting it from harmful free oxygen radicals. * Furthermore, pine nuts are one of the gluten-free tree nuts, and therefore, are a popular ingredient in the preparation of gluten-free food formulas. Such formula preparations can be a healthy alternative for people with wheat allergies and celiac disease. * Pine nuts are an excellent source of the B-complex group of vitamins such as thiamin, riboflavin, niacin, pantothenic acid, vitamin B-6 (pyridoxine) and folates. These vitamins work as co-factors for enzymes in cellular substrate metabolism inside the human body. * Furthermore, pine nuts contain healthy amounts of essential minerals like manganese, potassium, calcium, iron, magnesium, zinc and selenium. Pine nuts are one of the richest sources of manganese. Manganese is an all-important co-factor for antioxidant enzyme, superoxide dismutase. Therefore, consumption of pine kernels helps the human body develop resistance against infectious agents and scavenge harmful oxygen-free radicals. Afghanistan is known throughout the world for its fresh and dry fruits. But years of war and violence have hindered the country for taking full advantage of what its land and natural resources offer. The new air cargo corridor is expected to generate between $700 and $800 million worth of pine nuts alone each year.